Ginger root capsules are solid dosage forms that come as either a hard or soft soluble container in which dried ginger, as a fine powder, can be enclosed to be administered in a defined daily dose. The “shell” of a capsule is typically made from gelatin, though starch and other suitable substances are also available. Gelatin capsules should be taken with a warm drink, whereas vegetarian capsules (made from methylcellulose) can be taken with warm or cold fluids. Capsule sizes can vary from No. 5 to No. 000, excluding sizes used for veterinary purposes. In general, size No. 00 is the largest available size for consumers, and this capsule size has a capacity of 665 mg. Capsules are a practical and efficient way to ingest and reap ginger health benefits. They are also a highly effective means of controlling the dosage that you intake. Both gelatin and vegetarian capsule cases are available at specialty outlets. Pour the ginger root powder into a bowl and drag the capsule halves toward one another so that they scoop up the powder. Alternatively, you may use a capsule-making tray. When the two halves of the capsule are filled with the ginger root powder, slide them together carefully so as not to spill the powder. Store the capsules in a cool place, preferably in dark, glass containers with a hermetic seal. This preparation can be expected to have a shelf life of approximately three to four months. It is not recommended to take more than four grams of ginger per day in any form. Pregnant women should not take more than one gram of ginger per day and should always consult their doctor before use. 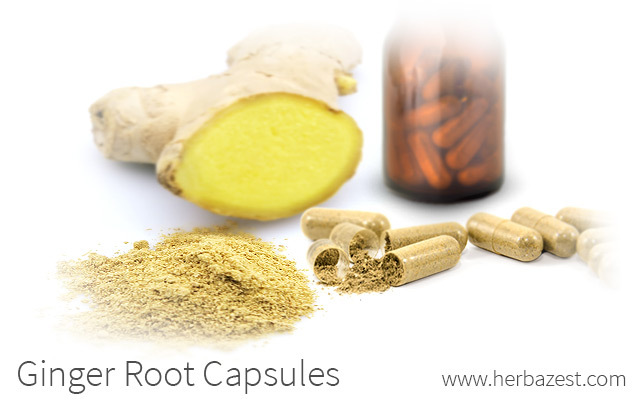 Taking capsules of ginger root is an excellent way to concentrate the benefits of this super-herb in therapeutic doses. Taking ginger supplements is great for the treatment of many gastrointestinal issues, as well as headaches and migraines. The preparation and storage of ginger root capsules is very simple and can easily be done at home by following the above directions. Preparing your own capsules helps to ensure the quality and adequate dosage you are going to consume for the different medicinal uses of ginger.